100% renewable energy suppliers Good Energy have informed us that they recently submitted a planning application for a 5.8MW solar farm at Oaklands Plantation, just north of Wareham, Purbeck. Subject to approval, Good Energy’s Oaklands solar farm will generate enough renewable electricity to supply around 1,500 homes, helping to achieve their mission of increased energy security and stability for the UK. The site at Oaklands is very well screened, positioned between a landfill site and a commercial forest. They are proposing to install the solar panels on land which is currently used as a Christmas tree plantation, some rough pasture and a motor-cross track. The land surrounding the panels will be recreated as grassland which can be grazed by sheep and will be managed to improve its quality and biodiversity. Some areas of the site will be adapted to recreate heathland and they will introduce a wetland area providing habitat for heathland species. Good Energy have also promised an annual investment of £5,800 (linked to RPI) into a community fund, which will be controlled by local people to support community initiatives. Good Energy has a stated mission of supporting the development of renewable electricity and helping deliver a more secure energy supply for the UK. They would love you to join them on this journey by supporting this latest project. You can submit comments on the Purbeck planning website before the end of Friday 29th August (apologies for the late posting here), where you can also find all the documents associated with the application. If you have any questions about the plans or you need some more information, please get in touch with the project manager, hugo.house@goodenergy.co.uk, and look out for updates on the project here. 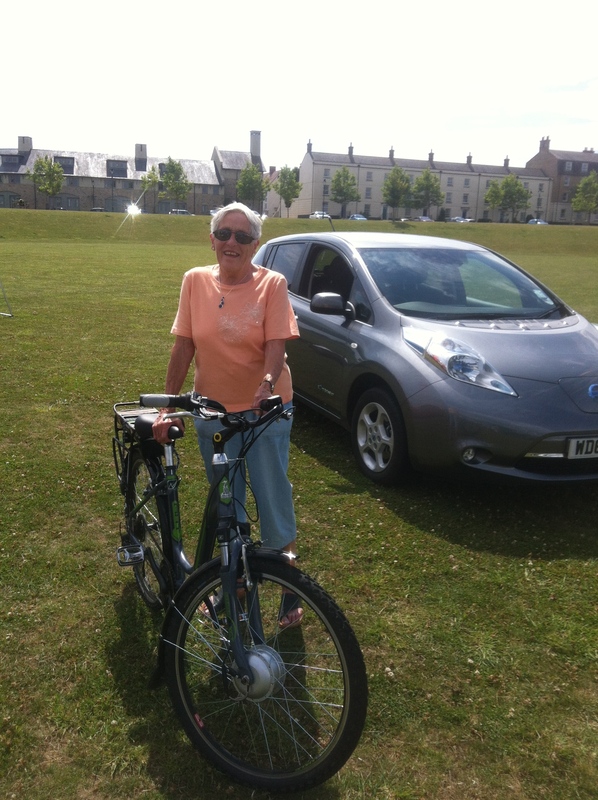 "I think this is a very good scheme and balances impact with renewable generation whilst supporting the local community financially. " I was very interested to see that the No to Slyers lane site features a link to another anti wind turbine site trying to make big news out of the dismantling of the Addingham wind farm just up the valley from Ilkley in Yorkshire http://noslyerslaneturbines.co.uk/weve-got-our-view-back/ . Now it just so happens that I lived in Ilkley about the time that these wind turbines were in the prime of their lives. They didn’t ruin the Yorkshire countryside in any way shape or form. I walked and drove around the area frequently and the only way they impinged on me was as a pleasant reminder that I was near home (a really wonderful home, wind turbines and all) as I drove back from the West past the reservoir. It appears that they have reached the end of their expected life span and have been taken down (we’ve never said that they can last forever – what can?). What does this actually mean? Well first and foremost it proves our point that wind turbines do not permanently affect the landscape. It is easy to take them down, recycle much of the materials in them and return the landscape to the form it was in before they were built so the idea that wind turbines permanently despoil the landscape is rubbish. Secondly the site concerned tries to make out that they hardly ever ran and didn’t produce much energy etc etc. I don’t have the performance figures for these particular turbines but great advances have occurred in the technology over the 2 decades that they have been running, so using any performance figures for them, good or bad, doesn’t make any sense in evaluating modern turbines except to say that these old stalwarts did their bit to prove and improve the technology. However the same people trying to tell you that wind turbines never work and are useless except as subsidy farming money makers for the greedy industrialists who build them are also the same people who have recently tried to tell you that we don’t need any more renewable energy to meet out 2020 decarbonisation targets because renewables have now topped 15% of electricity generation http://www.viewfrompublishing.co.uk/news_view/32595/15/1/dorchester-does-dorchester-care-about-turbine (“In a statement issued by the No Slyers Lane Turbines group they claim that the UK has already reached its EU-set target for renewable energy.”). There are two points here. The first is the obvious one that they must be deceiving you with one of these arguments as they are mutually contradictory. The second is that either they know little or nothing about the decarbonisation targets for the UK or they are happy to mislead you! Electricity is perhaps the easiest sector to decarbonise and will need to carry slower moving parts such as the road transport network. What is more, the answer for road transport will involve switching from petrol and diesel to electricity in a big way and the answer for home heating is likely to involve much more use of electric heat pumps so our electricity generation capacity will have to expand rapidly to provide for increasing demand from 80GW at present to around 120GW over the next couple of decade,s even if we improve energy efficiency meaning that we still need lots more electricity from renewables! Anti-renewables campaigners will continue to use misinformation and false claims to try to convince you that wind farms or solar parks are dreadful because they cannot rely on their only real argument which is that these technologies are visible from some distance away and they don’t want anything in their back yards to change ever, however much we need to solve the bigger problems in life. "Wind energy continues to post record performances as shown here http://www.businessgreen.com/bg/news/2362813/wind-energy-outstrips-coal-as-industry-smashes-august-generation-record?utm_term=&utm_content=Wind%20energy%20outstrips%20coal%20as%20industry%20smashes%20August%20generation%20record&utm_campaign=BG.Renewables_RL.EU.A.U&utm_medium=Email&utm_source=BG.DCM.Editors_Updates As it displaces coal generation it is achieving the most important aim of reducing our GHG emissions. These impressive figures prove that wind energy is effective and gaining momentum but it still leaves us with a lot to do to meet the 2020 targets that are only a waymarker on the route to the real target of 80% decarbonisation by 2050. If it turns out that we might do better than these targets there are very sensible calls to try for decarbonisation by 2030 so there is never any justification for saying that we have done enough and can rest on our laurels. " Can electric cars and vans solve the renewable energy storage problem? The four main electrical power distribution networks have just announced a two year project to test the viability of using the batteries of electric vehicle fleets (when parked up and connected to the grid for a long trickle charge) to balance the grid. The two stage project will first test the impact on battery life and then produce a prototype vehicle equipped with validated processes and hardware. It’s easy (certainly for me) to imagine a future when the majority of vehicles are electric and your electrical supply company buys electricity from you from your car battery when the software within the car tells the grid it has power to spare. Your car would always be connected for charging and exporting (grid balancing) when parked up at home and the grid would only draw back power during times of peak demand when your battery was fully charged. I haven’t done the maths but it could be that the massive storage capacity available will far exceed that needed to balance the grid to cope with intermittent renewables such as wind and PV. The rate of feed in tariff for each technology is reviewed every 3 months and if more than a certain designated megawattage is installed then that triggers a drop in the tariff. This has just happened for hydropower, wind and AD. PV remains untouched this round. 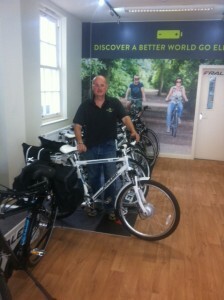 See http://www.british-hydro.org/news/decc_confirm_10_degression_for.html and follow the link. For a hydro scheme you can pre accredit with Ofgem to fix you tariff rate at the current level if you have the required Environment Agency EA licenses but have not yet installed. Hydro schemes take years to develop due to the complexity of EA license requirements and a long time to install because of the bespoke nature of each project (no off-the-shelf-solutions as with solar and wind. So there is a large proportion of pre=accredited but unbuilt hydro schemes that have triggered this degression. Worse still, we are expecting another 10% degression in July 2015. When you add to this the recent rise from £135 to £1500 for EA licensing you can see that hydro is fast becoming unviable. We develop these renewable projects because we know they are needed to mitigate climate change and we are environmentalists. But this government has constantly changed the goal posts and keeps the industry destabilised and performing well below its potential. Ed Davey has done the best he can at DECC and was until recently ably supported by Greg Barker (who fellow Conservatives accused of “going native” within DECC ie agreeing with Ed Davey’s line). But he has been partially undermined by George Osborne who has fossil fuel leanings and probably doesn’t want to see those interests undermined by a renewable industry that is too successful. I would say from recent RE generation stats, you can see that with stable support and let off the leash, RE could kill off the fossil fuel industry quite quickly. 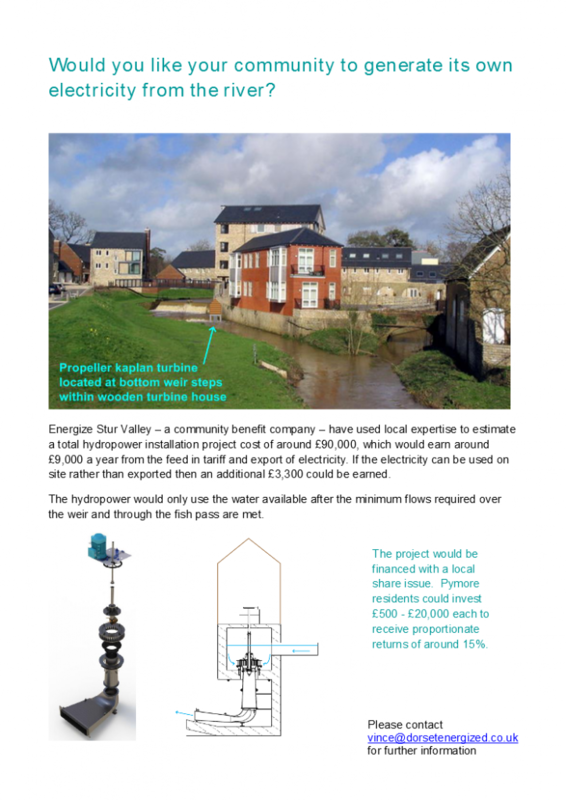 Energize Stur Valley (a group comprising several people from Dorset Energized) – were asked by members of the local community to investigate the viability of installing a small hydropower electricity generation set-up on the river Brit, which runs through the village of Pymore near Bridport. A site survey was carried out and a proposal has been created – you can see it below. There really is a Renewable Energy Revolution Going On! I’ve just read about the record breaking wind energy records for a day in August 2014. 5.0 GW of electricity supplying 17% of the UK demand on a Sunday night. At the same time hydro was delivering 2.0% and biomass 2.5%. So we had 21.0% of electricity being delivered by renewable`s. My calculations indicate an additional 1% of UK demand over the course of a year. Less than I was hoping for but growing quickly all the time. Especially Solar PV, which is apparently found on 1 in every 32 houses in the south west. I know from my own generation from 4 kW of PV and the generation from the South Somerset District Council PV portfolio that 2014 has been a bumper year. "More on the tumbling RE generation records! Our opponents focus so much on the times when a particular individual RE technology isn’t performing – here’s evidence of how a “perfect storm” can benefit RE output and how, with increasing capacity of a varied bag of technologies the chances of an overall failure of RE will become less and less. Add in the potential for storage and demand side management and it shows that there is an answer to RE intermittency as long as 1. We build plenty of capacity which means we cannot rely purely on RE sites miles and miles from the nearest house and 2. We spread our efforts across a wide range of technologies and locations which means that trying to rule out any one technology on the grounds of marginal differences in cost per MWh is pointless and really just a smoke screen for objecting to the RE proposed for your neighbourhood. http://www.businessgreen.com/bg/news/2360329/uk-renewables-industry-celebrates-record-start-to-2014?utm_term=&utm_content=Government%20figures%20confirm%20renewables%20generation%20was%20up%2043%20per%20cent%20compared%20to%20first%20quarter%20of%20201&utm_campaign=BG.Breaking_News_RL.EU.A.U&utm_medium=Email&utm_source=BG.DCM.Editors_Updates "
This sounds like a great event and clearly a lot different from traditional bank AGM`s – have a read of the information below and follow the link to more about this on the Triodos website. At the annual meeting this year the participants will be examining the real cost of food, energy, society and finance – demonstrating how the sustainable option provides true value in the long run. There are some great speakers including, Patrick Holden, Director of The Sustainable Food Trust, Kids Company’s Camila Batmanghelidjh, Jeremy Leggett, Chairman of Solar Century and Charles Middleton, Managing Director of Triodos Bank. This free event will also be a great opportunity for anyone who’s interested in a more progressive approach to banking to find out more about Triodos Bank. 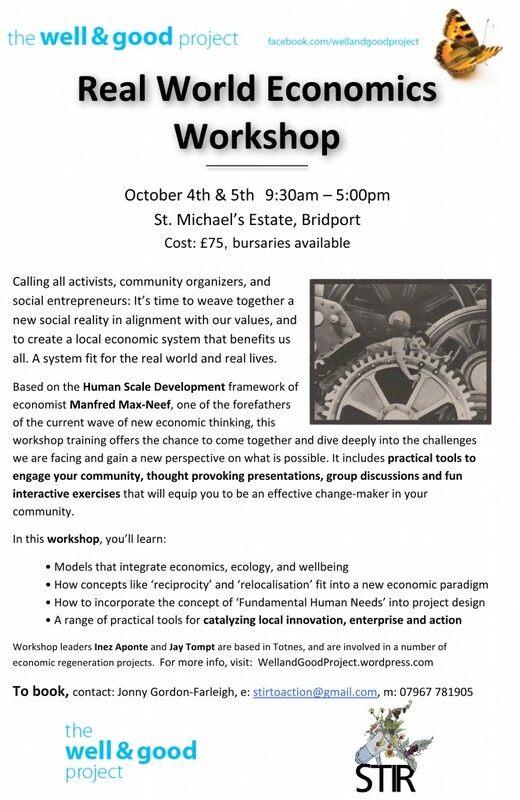 Triodos are looking to get in excess of 500 attendees on the day who will be a mixture of their partners, customers (savers, investors and businesses), and anyone else who has an interest in sustainability or is intrigued to find out more about them. Dorset Energized and Respect Organics have joined forces to offer one free place to aspiring young people who might wish to increase their skill levels. We welcome applications from anyone interested in attending the course with a short CV and 50 words on why they would benefit from the course. 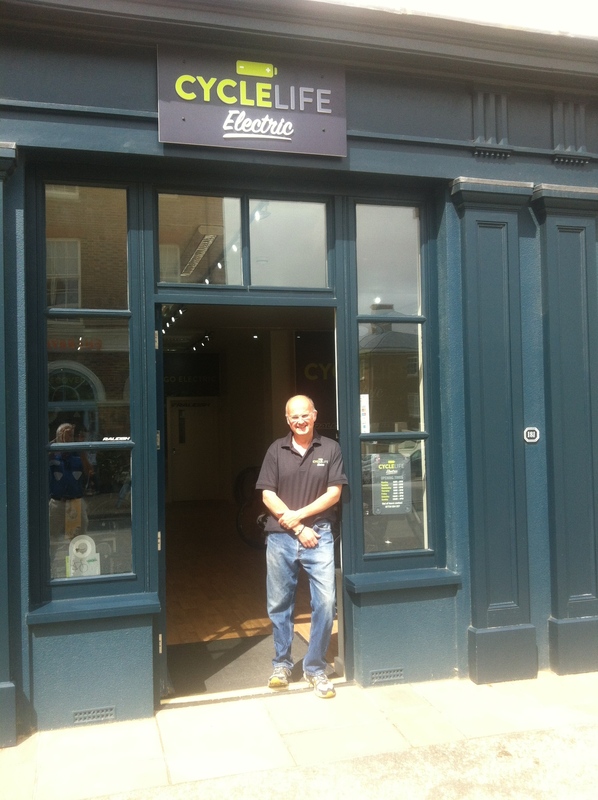 Last Saturday, 2nd of August, the first ever Raleigh Bicycle shop dedicated entirely to selling Electric Bikes opened in Poundbury, Dorchester. 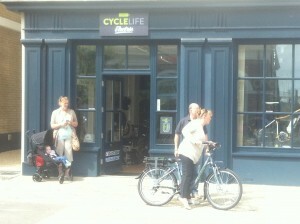 Having started the Dorset Ebike Centre on his farm at Chalmington, Peter Claxton decided that the levels of interest warranted a shop in town, so Cyclelife Wessex was born. 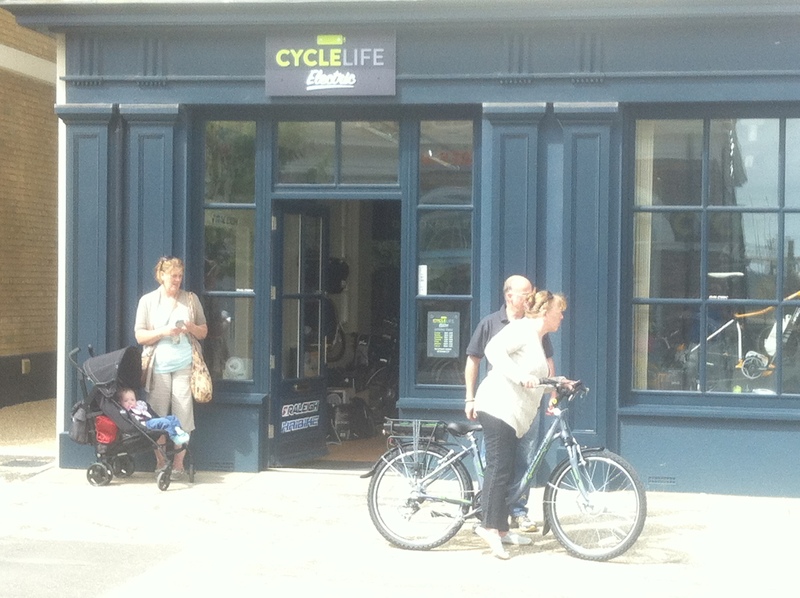 The shop will be selling the full Haibike range and Raleigh`s own brand electric bikes – so choices for all styles of riding and backed by Raleigh`s class leading after sale service. 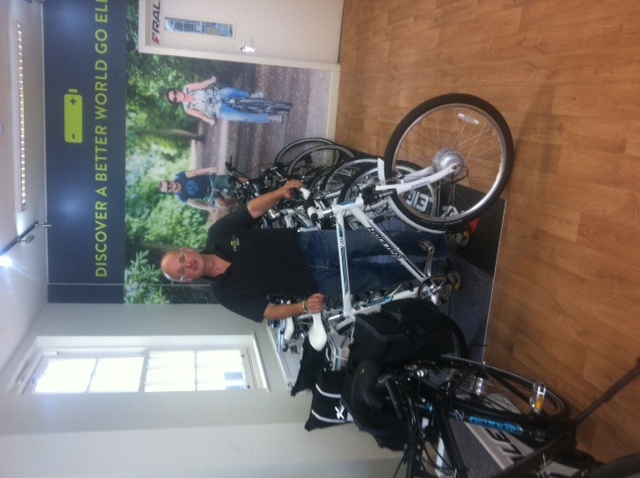 Having tried several of the range of bikes ourselves we know how good they are – and after much good feedback after demoing a Haibike and a Raleigh at Dorchester`s recent Ecofair we know that these bikes only take one ride for someone to start wanting one. 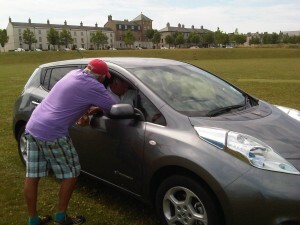 I drove to London on Friday in my Leaf Electric car and was amazed at how easy the journey now is. 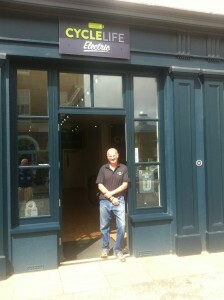 I charged up overnight on Thursday and set off to London stopping at Fleet services 85 miles from home then onto Richmond few miles around London and then back to Fleet services, coffee and another free charge fro Ecotricity and home to Sturminster in Dorset. Total cost £2’s, comfort, huge ease of drive, tremendous. Can’t wait for next trip up to Birmingham this weekend. 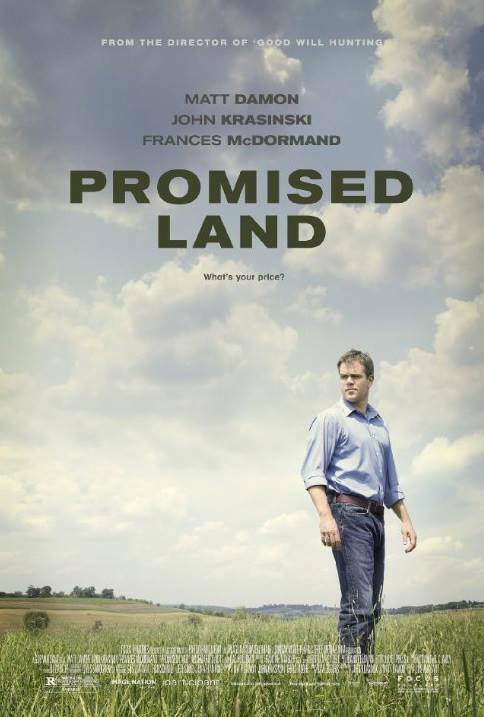 This Wednesday, 6th of August at 7.30pm the Langton Matravers Arthouse Cinema is showing the film Promised Land starring Matt Damon. It would seem that this last week has been another good time to bury bad news. What with the situations in the Ukraine and in Gaza, the air crash in the Sahara and the more jolly stuff from the Glasgow games the fact that the government put out more details about its plans for underground nuclear waste storage hardly got a look in in the news. Apparently sums in the millions will be offered to communities that offer to host nuclear waste storage and when (sorry – if) no communities are stupid enough (sorry – community spirited enough) to offer themselves up then government ministers will allocate sites and the normal local planning rules will no longer apply and local authorities will not have a veto. What with HS2, fracking and nuclear waste it is clear that localism only applies if it generates the decisions that central government wants like a brake on renewables development because it doesn’t suit the government’s friends in big business if little firms can go setting up wind turbines or solar farms producing real competition for struggling fossil fuels and demanding that government do something about our creaking national grid. So given that the government knows that no communities are going to volunteer to take on nuclear waste, where will the axe fall? Well let’s face it Dorset in general got to be a contender. It’s got sea transport links, low population density and rolling chalk hills that would be easy to burrow into to make the vast caverns for the storage of bulky low grade radioactive material. Additionally it is conveniently at the opposite end of the country to the existing facility at Sellafield minimising waste miles if the job is split between Dorset and Sellafield such that Dorset copes with the stuff from the South Coast reactors. What’s more it has no come back at all when it is pointed out that Dorset isn’t pulling its weight in decarbonising the economy so It’s their turn. Even better there is a specific site that would be ideal that is already government controlled with a village to give its name to the site that hasn’t even got any residents to complain – Tyneham. If Scotland votes for independence a reduced UK may well not continue to support a fleet of main battle tanks. We no longer have the capacity to build them and we didn’t send Challenger to Afghanistan because it would have cost too much. Without Challenger the Lulworth ranges could be redundant and Povington Hill could be hollowed out for the purpose. I’m heartily sick of hearing opponents of wind turbines and solar farms telling me that nuclear is the answer. Not only do I know it isn’t because of technical reasons that I may cover at another time but also because I believe that the only reason that they are saying it is because they envisage everything to do with the nuclear industry being in someone else’s back yard not in their beloved Dorset! Well here’s your chance to put your money where your mouth is. Start a petition to get nuclear waste under the Purbecks. It certainly won’t have the visual impact of a decent number of wind turbines. You’ll probably get lots of signatures but not from many people in Dorset I suspect! Alternatively we could take a leaf out of the book of the people of Delabole. Not enough people know that one of the reasons Delabole is the site of the very first wind farm in England is that it was proposed as a site of a nuclear power station and local people wanted to have a constructive counter argument to show that they were doing their bit rather than just NIMBY!